At the leading trade fair for industrial valves, the Valve World Expo 2016 in Düsseldorf, Hartmann Valves presented his brand new booth concept. The bright design with impressive constructions, new messages and 3D product animations attracted many visitors. Numerous international customers and partners took the opportunity to meet the Hartmann team and to learn more about our ball valve and wellhead solutions. Investing in trade shows and exhibitions – especially in these hard times for the energy industry- has been the right decision for Hartmann Valves in 2016 and many new contacts could be made. One focus was on the renewable energies – with the GeoTHERM fair in Offenburg, the “Praxisforum Geothermie” in Munich and the European Geothermal Congress EGC in Strasbourg, France. 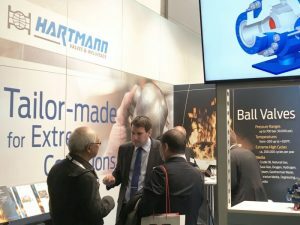 Traditionally, Hartmann also participated in the DGMK Conference in Celle, the German DIAM fair in Munich and the Valve World Expo in Düsseldorf. Also the first Hartmann customer event with its technical and user presentations has been an interesting platform for exchanging experiences. In addition to further international fairs in Russia and the Middle East region our Managing Director Carsten Braun, our sales team and international partners visited numerous customers and congresses all over the world.